Leading a session with a group of secondary teachers from various departments, I boldly ask for words their students struggle to spell so I can show them how our strategies work. The maths teacher says, 'isosceles'. Oh, super. understanding the logic of the language we're all trying to spell. learning how to reduce a word to the parts they don't need to focus on remembering and the parts they do need to focus on remembering. working out how best to remember those bits. Teachers and students alike should be collaborating on making the most of limited memory. So, when the maths teacher offers up 'isosceles', I know there's no showing off my spelling brilliance, just demonstrating what a good speller does when faced with a word she genuinely doesn't know how to spell. 1. Say the word clearly and count the syllables. 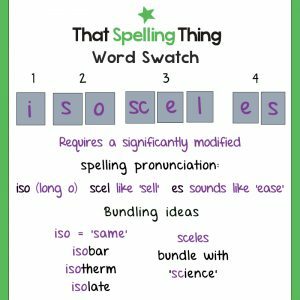 i-so-scel-es or i-so-sce-les. The natural pronunciation has the short /o/ of /pod/ in the second syllable. 3. Identify the tricky bits. For me, that was trying to remember which /s/ was spelt <s> and which was spelt <sc>. 4. Decide on how best to remember which is which by hanging the unfamiliar on the familiar - what we call 'bundling'. For me that was changing the spelling pronunciation to a long /oe/ sound so I could bundle it with 'isobar' which is more familiar to me and easier to spell. It will be familiar to geography students too. 5. Now, by elimination, the second /s/ sound is spelt <sc>. If I needed more help with that, I might bundle it with 'science'. Easy means easy for me. Your students might need a separate bundle of words with that /eez/ spelt <es> plural ending crisis/crises, analysis/analyses, diagnosis/diagnoses. Fortunately, not all maths words are as complex as 'isosceles'. approximate - first learn to spell the verb with the clear 'ate' final syllable. Bundle it with 'separate', 'duplicate', 'deliberate' etc -all of which have one pronunciation for the verb and another for the adjective. similar - bundle with other /er/ words spelt <ar>. Students choose a familiar word like 'collar' or 'dollar' for the top of the list. Then you can add: 'perpendicular', 'angular', 'muscular', 'polar'. independent - is in my 3 e's bundle with 'element' at the top. Would appreciate ideas for other words with three e's in three separate syllables. You can also just have an 'ent' bundle and add 'consistent'. circumference - pronounce with 4 clear syllables and bundle with 'difference', 'conference', 'interference'. divide and positive - both have short /i/ sounds that people overpronounce incorrectly ending up with devide and posative. Bundle these two together and stress all the short /i/s. Add 'ridicule' and 'ridiculous'. vertical, quadrilateral, equilateral - This is a great maths bundle. Add 'diagonal'. More common words for the top of the bundle might be 'usual', 'actual', 'viral' or 'natural'. angle - teach this side-by-side with angel. Add 'angelic' to help remember the heavenly being spelling pattern. Use familiar words like 'tangle', 'bangle' 'strangle' for the head of the bundle then add triangle. If you start with pronuncation, you can't end up with traingle. average - Create a bundle of with the /age/ ending. There are tons of them. 'beverage', 'leverage', 'carriage', 'marriage' Make sure to pronounce them all with 3 clear syllables. I'd try to get students who don't normally pronounce their r's (most of Britain) to say av/er/age, bev/er/age. It's easier (in this Canadian mind, granted) than remembering the unstressed syllable plus 'rage'. av/e/rage etc. pentagon, hexagon - All shapes have this <agon> ending. Maybe call it the 'wagon' bundle. Learning the adjective alongside the noun will help with clearing up the unstressed syllable. 'pentagonal' and 'hexagonal' etc have very clear /a/ sounds. 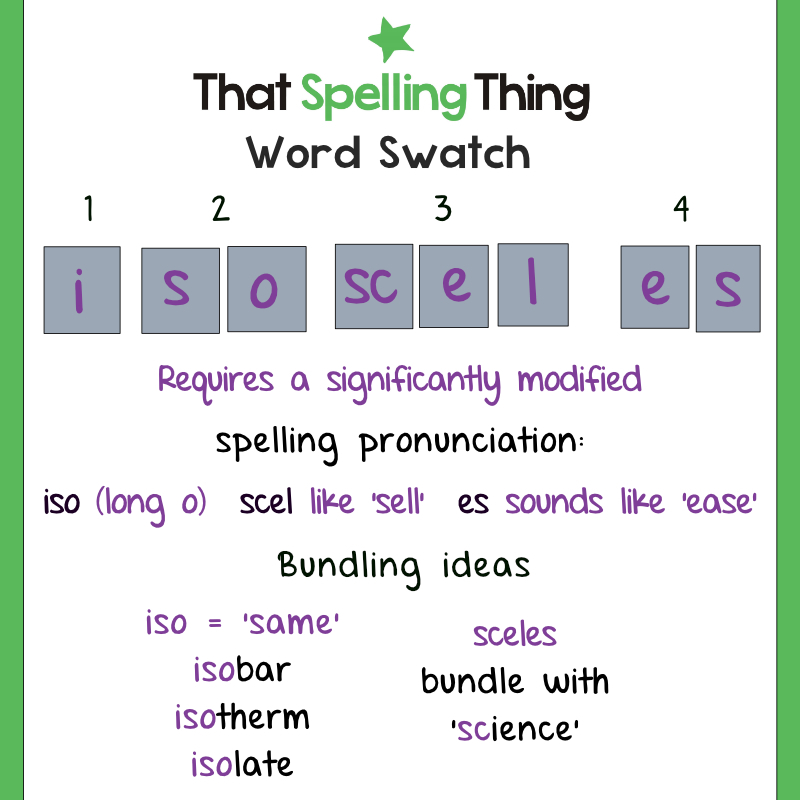 I hope you can see the potential for wrangling spelling in your classroom. The more you use these strategies, the more patterns and relationships will emerge for both you and your students.